I’ve had a very important objective for awhile now. I think there comes a time in every baker’s life when they realize that they need perfect basics. I love to make new things, sweet things, and even the occasional odd thing, but you really need delicious bases on which to build. 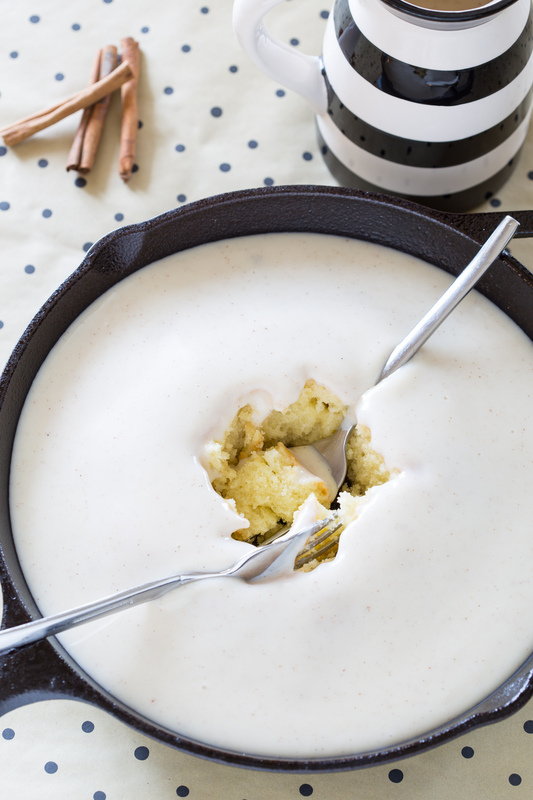 That’s why I’ve been determinedly scouring the internet for recipes, reviews, wives’ tales, photos, comparisons — you get the idea — for (drum roll, please) the PERFECT WHITE CAKE. Not a dry styrofoam white cake. Not a brick of white cakeness. I wanted a moist, tightly crumbed, perfectly dense white cake. 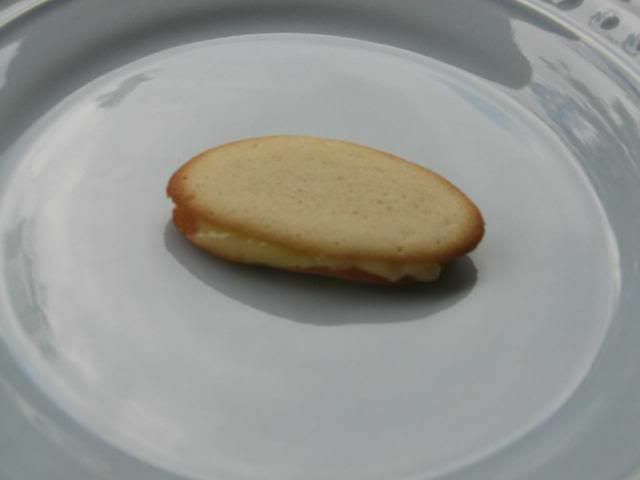 It was my great fortune to find this very thorough white cake comparison on The Way the Cookie Crumbles during my search. 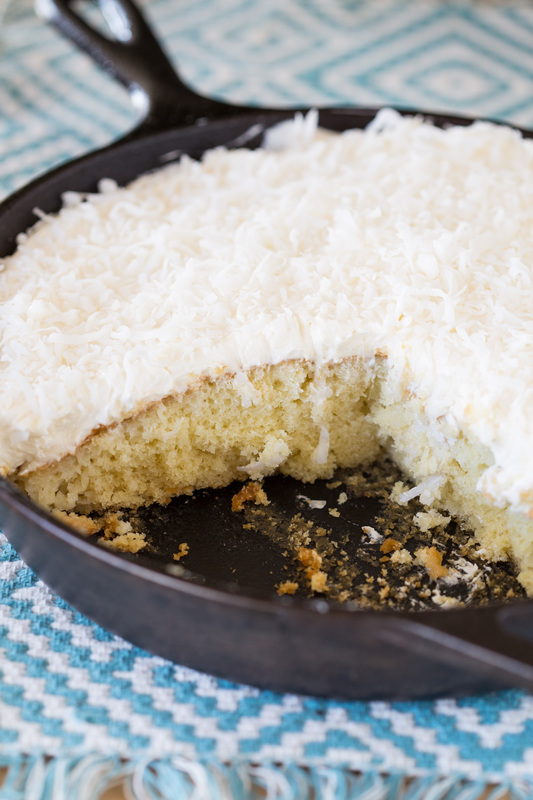 I baked the author’s adaptation of Cooks Illustrated’s Classic White Cake, and I feel like I’ve hit the jackpot. I have a new perfect white cake base! 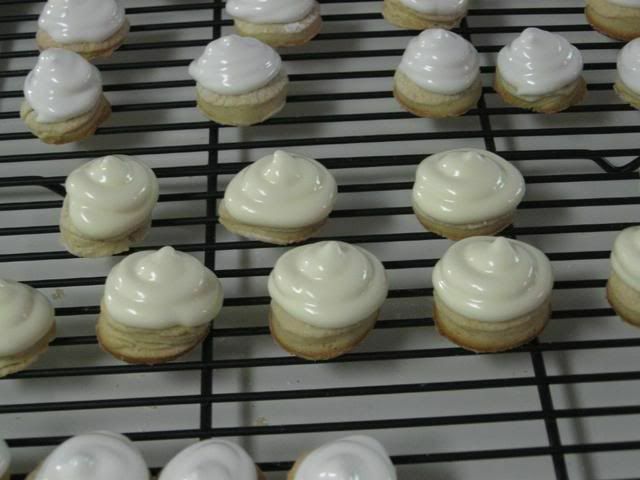 White cake does not a cupcake make, however, if you’ve got a hankering for experimenting and a reputation to uphold. For that reason, I decided to try a few new things along with my white cake: first, a sultry mango curd filling (the beautiful thing about filling a white cake with a curd is that white cakes typically use only egg whites, while curds use egg yolks — what a perfect pair). 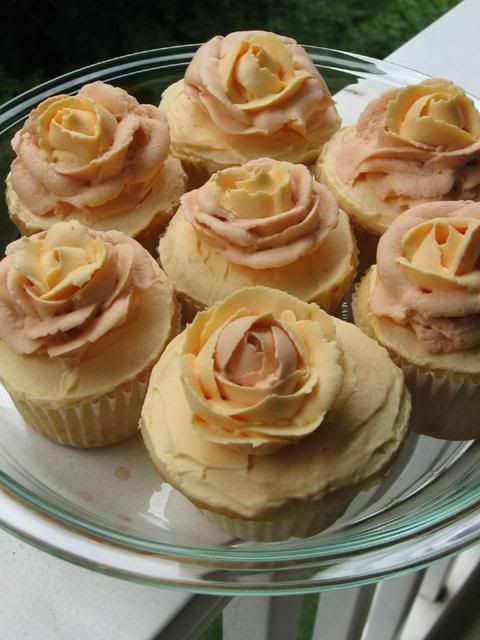 Second, buttercream roses. Monsoon Wedding: Dubey and his love in the rain under a marigold umbrella. 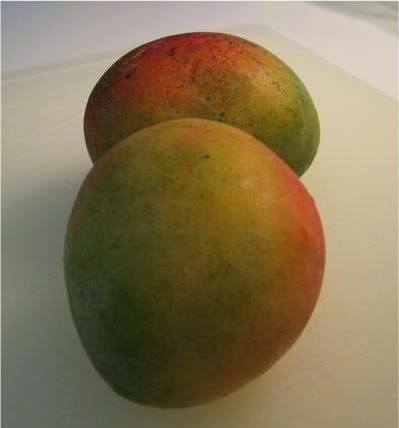 In short, I love mangoes. 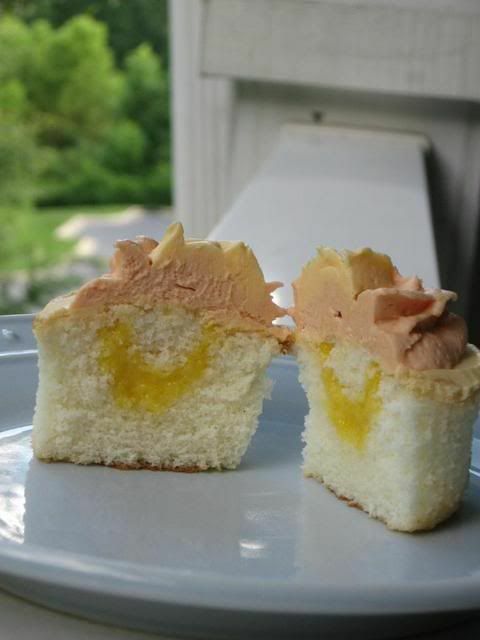 When I saw Smitten Kitchen’s version of mango curd, I immediately knew that I had to stuff it in a cupcake. 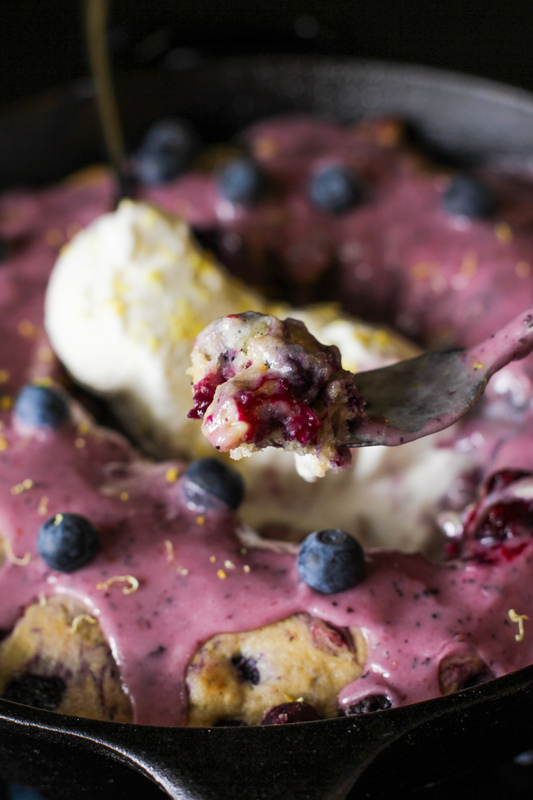 Why is my reaction to beautiful things sticking them into baked goods? That’s probably a question for another day. 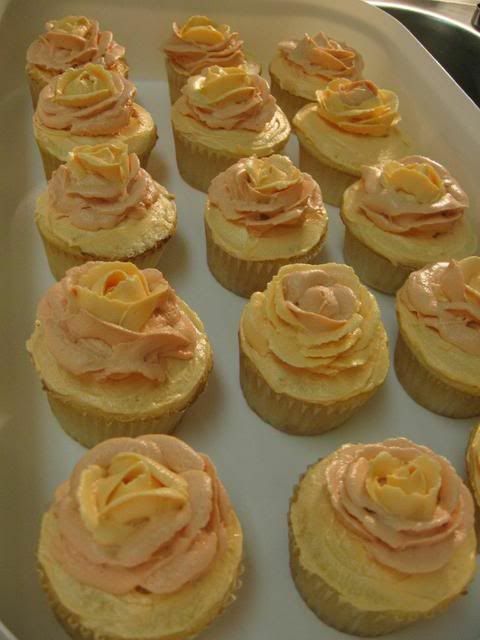 As for the buttercream roses, they answered my need for something pretty and simple on top of my cupcakes. 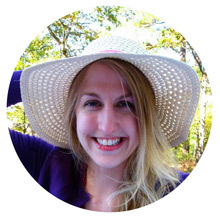 I came across the beauties on Smitten Kitchen again, if it’s any indication of how much time I spent perusing her blog this week. I’d never tried to make an icing rose, but after watching millions (no, really, ask Mike how many I forced him to watch with me) of videos on the topic, I thought I’d give it a try. I whipped up a raspberry buttercream, bought a flower nail and some rose tips, and went to work. While my frosting was an imperfect consistency and it proved harder than it looked, I think the technique was a success. I can’t wait to try again with different frostings! I hope you’ll try it (and keep trying . . . and keep trying) if you haven’t already. If you want a great tutorial, I like this one and this one. All of these delicious components — the perfect white cake, the tangy mango curd, and the raspberry buttercream — came together to form these Mango Raspberry Rosecakes. Peekaboo! My mango curd is smiling. The moist white cake envelopes the exotic and bright flavor of the mango and, topped with tart raspberry, forms a sweet, summery treat. The only thing I wonder, both because of my frosting rose difficulties and because the buttercream almost overpowered the mango, is if a raspberry cream cheese frosting might be a better choice. I’ll leave that up to you to decide. Either way, I know you’re going to enjoy these amazing flavors. 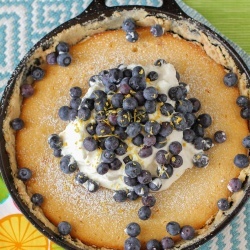 Feel free to deconstruct these treats and use the perfect white cake base with other fillings and frostings, and the mango curd in other cakes (or even as a delicious spread for shortcake, shortbread cookies, or toast). Make mango curd: This can be made a day in advance and refrigerated. Puree mango, sugar, lime juice and salt in processor, scraping down sides of work bowl occasionally. Add yolks; puree 15 seconds longer. Strain through sieve set over large metal bowl, pressing on solids with back of spatula to release as much puree as possible. Discard solids in sieve. 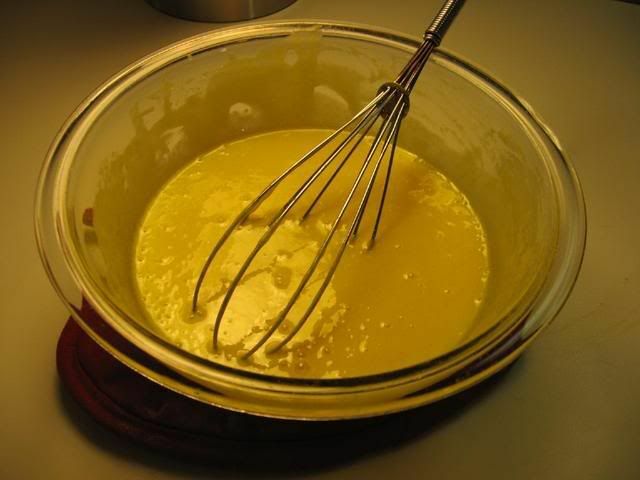 Set metal bowl over saucepan of simmering water (do not allow bottom of bowl to touch water); whisk puree until thickened and thermometer registers 170°F., about 10 minutes. Remove from over water. Whisk in butter 1 piece at a time. Cover with plastic wrap (directly on the curd to prevent a skin from forming) and refrigerate for several hours (or overnight). Note: I’m freezing my excess according to Fine Cooking’s instructions for lemon curd, that is, up to two months. 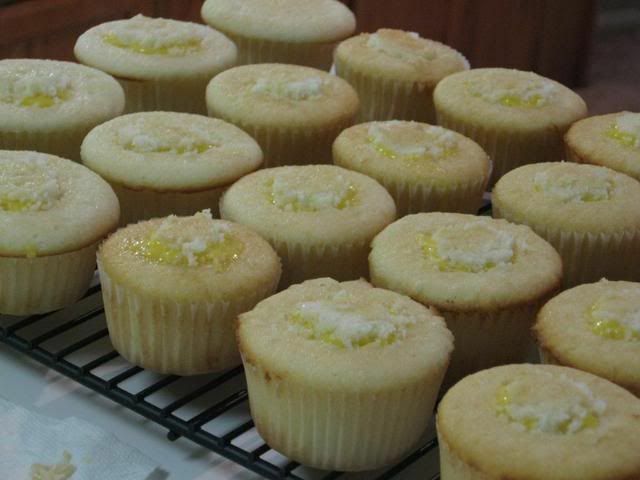 Make the perfect white cupcakes: Set oven rack in middle position. Heat oven to 350 degrees. 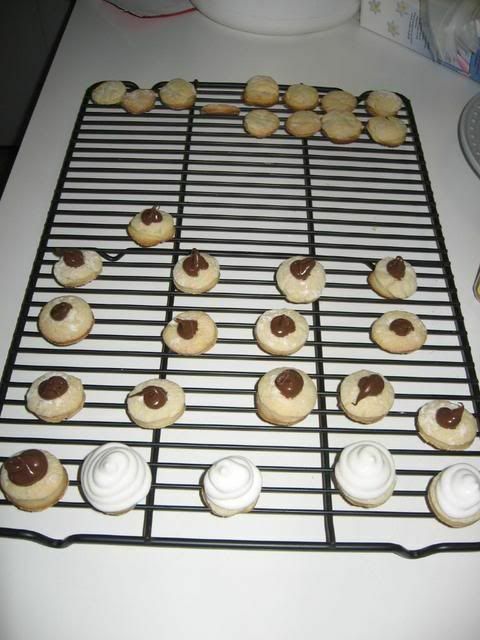 Spray cupcake pans with nonstick cooking spray or line with cupcake papers. 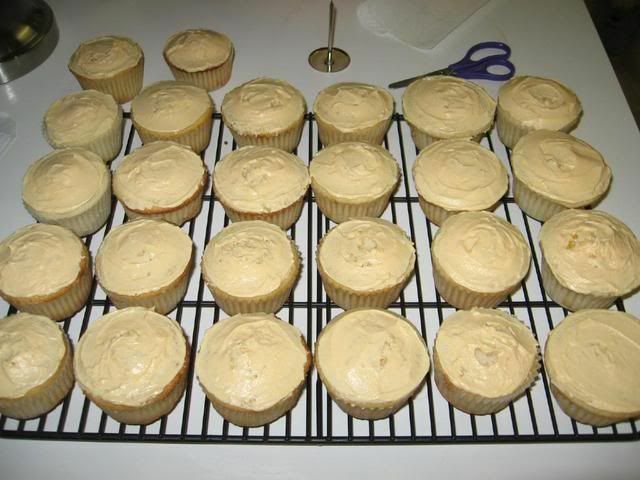 Divide batter evenly in cupcake pans and smooth tops of cupcakes. Arrange pans at least 3 inches from the oven walls and 3 inches apart. 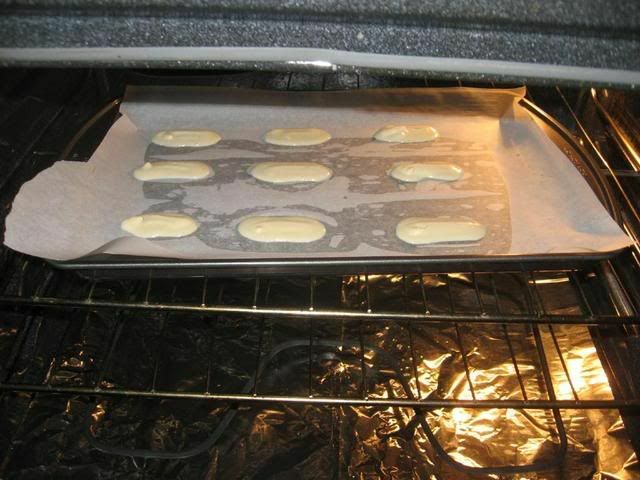 (If oven is small, place pans on separate racks in staggered fashion to allow for air circulation.) Bake until thin skewer or toothpick inserted in the center comes out clean, about 15-16 minutes. Let cakes rest in pans for 3 minutes. Transfer to wire rack for cooling completely, about 1½ hours. To fill with mango curd, core the middle of the cupcake using something like the cone method (not easy with such a moist cake, but no worries — your frosting will cover any mess you make). Pipe or spoon in as much mango curd as you can fit. Replace your cupcake “cone” and frost. 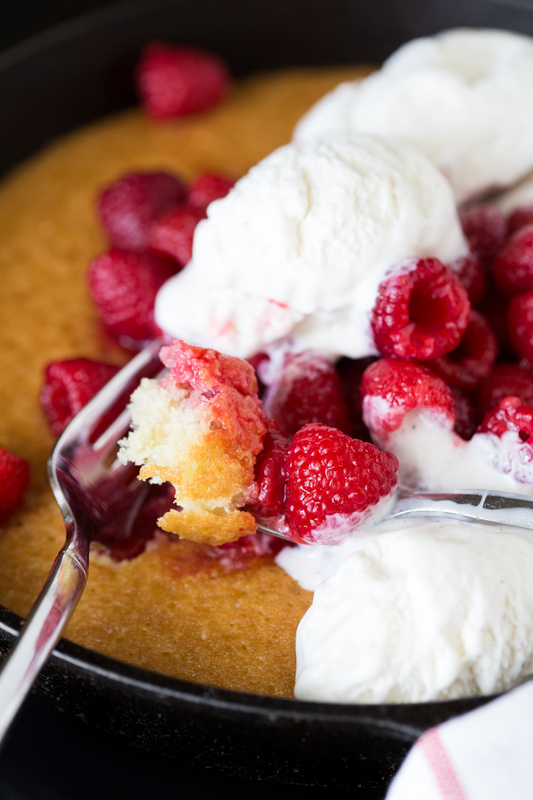 Make raspberry buttercream: Cream all ingredients (except milk) together. Add milk slowly as needed to produce desired consistency. 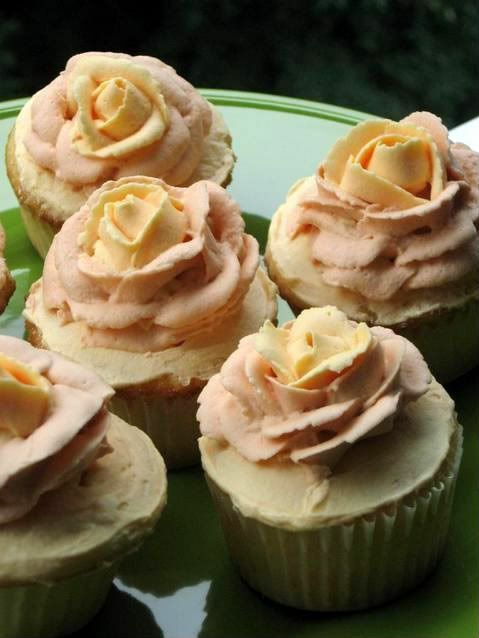 If you’re planning on making roses, you want a thick, stiff frosting (but still smooth). 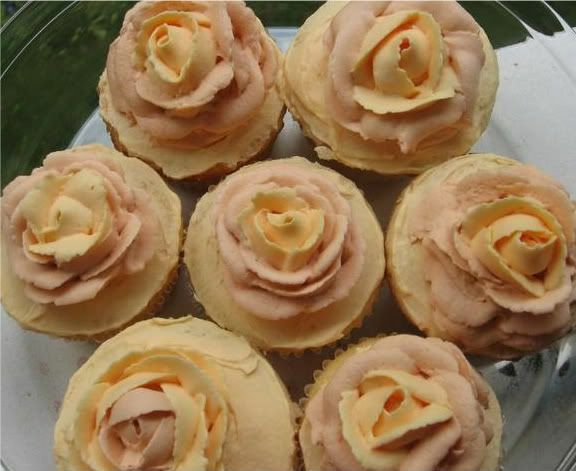 For the roses, frost cupcakes lightly with the back of a spoon or an offset spatula. Then create the roses on the flower nail and transfer to the top of the cupcake (use this tutorial or this one). Otherwise, frost as desired. 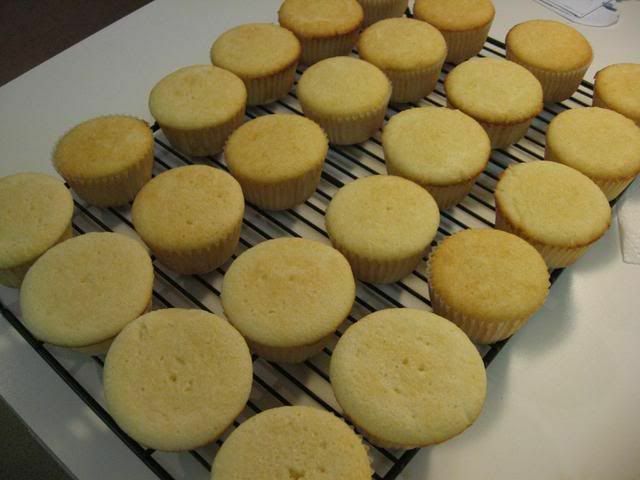 Perfect white cakes fresh from the oven. Stuffed with mango curd and ready for frosting. As I mentioned in my previous post, the July Daring Bakers’ challenge was hosted by Nicole at Sweet Tooth. 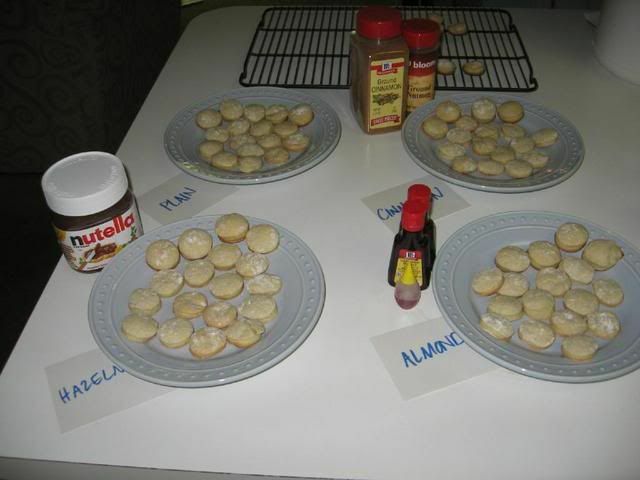 She chose Chocolate Covered Marshmallow Cookies and Milan Cookies from pastry chef Gale Gand of the Food Network. While the Milan cookies were delicious and dainty, the Mallows were scrumptious and indulgent. 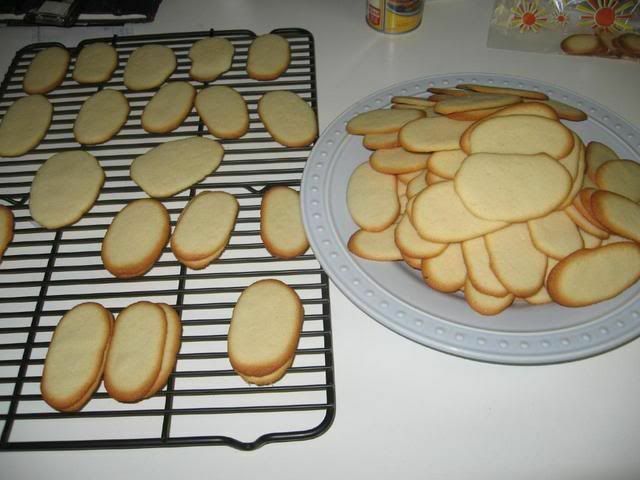 They were two very different types of cookies, but I learned from each recipe and enjoyed the variety! If I had to choose a favorite, though — and you know I do — it would be these Mallows. 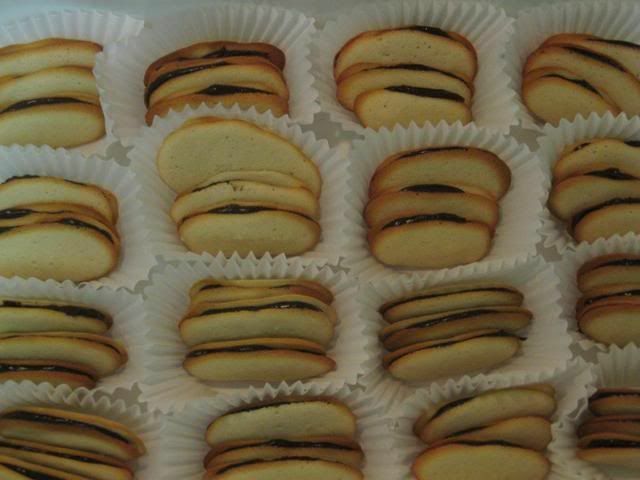 Mallows are chocolate-covered, marshmallow-topped cookies. The wonderful thing about these Mallows (besides the amazing flavor) is how versatile they are. Homemade marshmallows are very easily flavored and customized, so I was able to make four Mallow “flavors” with hardly any more trouble than just making one. I chose Almond, Hazelnut, and Cinnamon Mallows in addition to the plain. 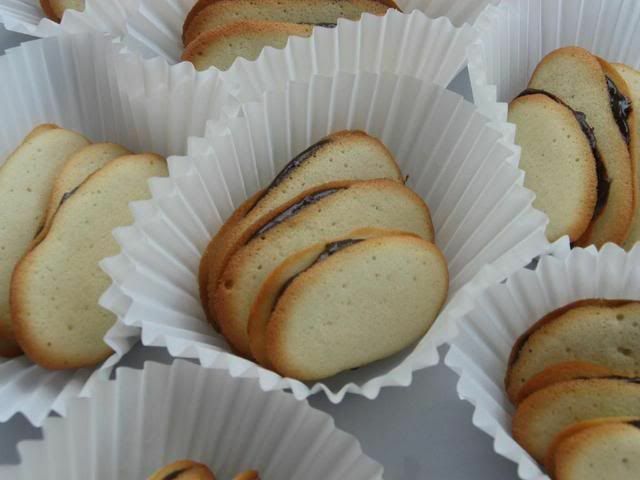 Almond Mallows have an almond sliver between the cookie and marshmallow, and another atop the cookie. In addition, their marshmallows are flavored with vanilla, almond, and butter flavorings. The marshmallow is as rich as a buttercream frosting, and so tasty! I bet this version would also be delicious with some creamy almond butter piped on under the marshmallow. 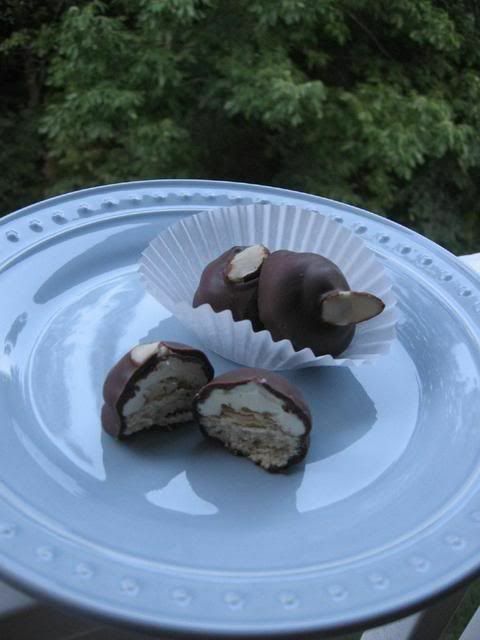 Hazelnut Mallows (my favorite!) 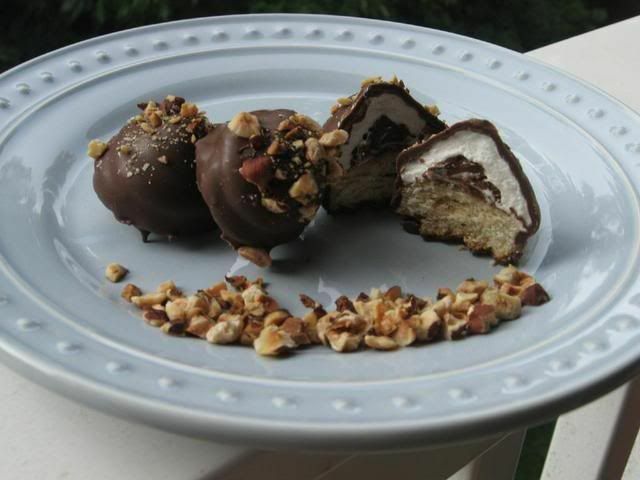 have Nutella piped on under plain marshmallow, and are topped with toasted hazelnuts. Cinnamon Mallows have cinnamon and nutmeg flavored marshmallow, and a light dusting of cinnamon and cocoa powder on top. 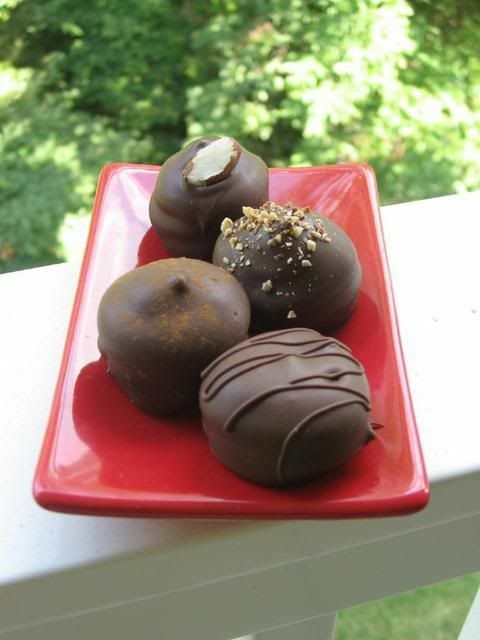 Enjoy experimenting with flavors! 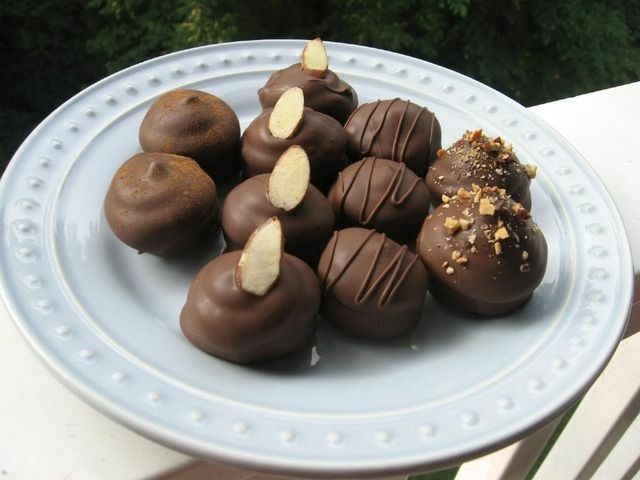 Different sorts of nuts, spices, and extracts are all tools for tweaking your mallows. Some Daring Bakers piped a bit of jam or nut butter below their marshmallows for an added surprise. Use food coloring to denote different flavors of marshmallow. There’s a lot of room for creativity here. 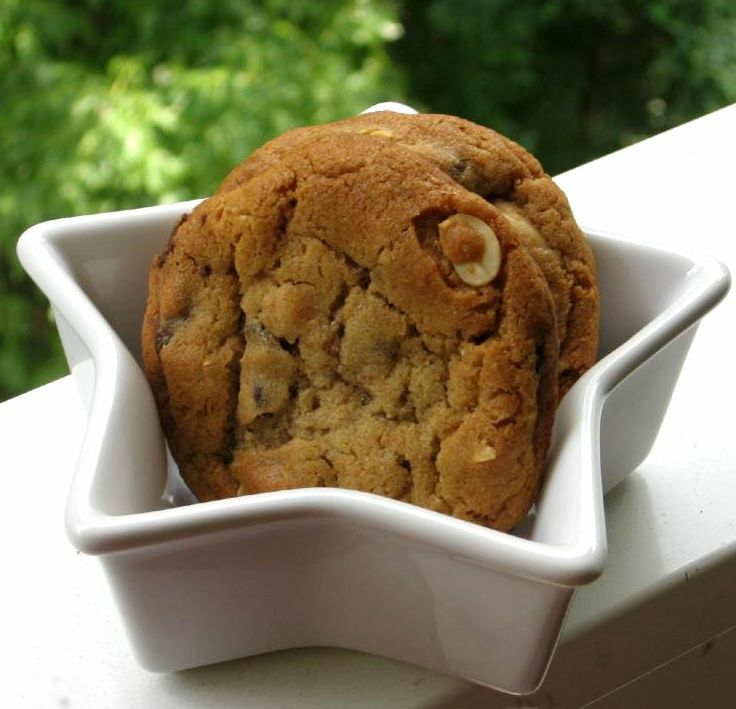 Gale Gand’s original recipe seemed to need some tweaking, since Daring Bakers typically ended up with — I kid you not — hundreds of cookies, and only enough marshmallows to cover around 50. 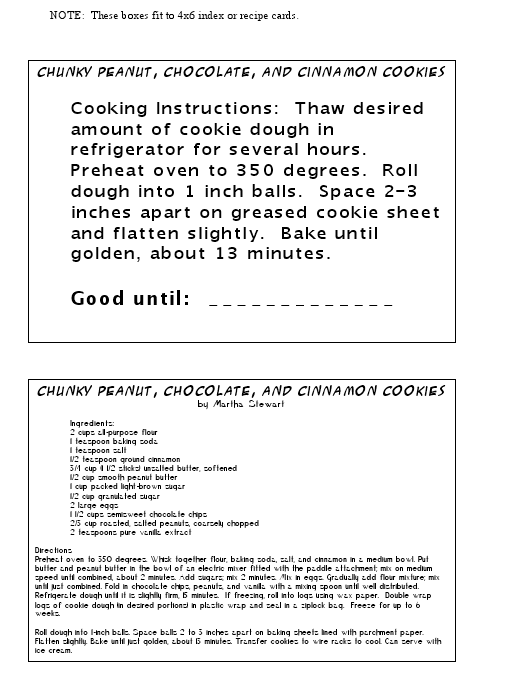 I’ve adjusted the recipe below to hopefully yield the correct amounts! 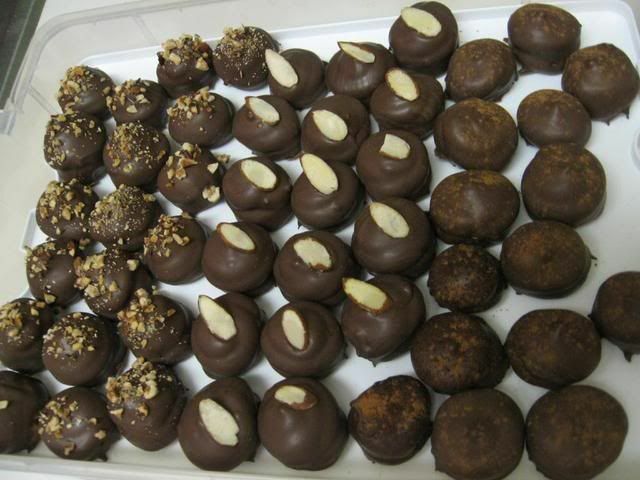 Also, Gand’s original recipe called for melting semisweet chocolate and vegetable oil to make your coating. After reading that about half of the Daring Bakers’ were having trouble with their chocolate not setting — especially those who live in warm or humid climates — I decided not to take a chance with it. 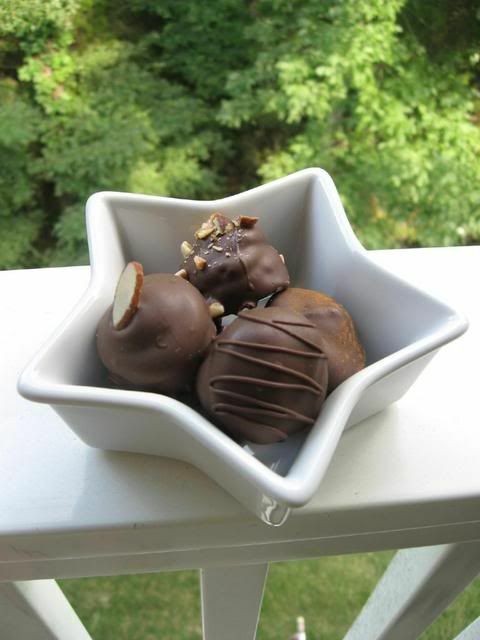 Instead, I used my beloved CandiQuik dipping chocolate, which dries in literally minutes! You can probably find this at Lowes Food or SuperTarget. 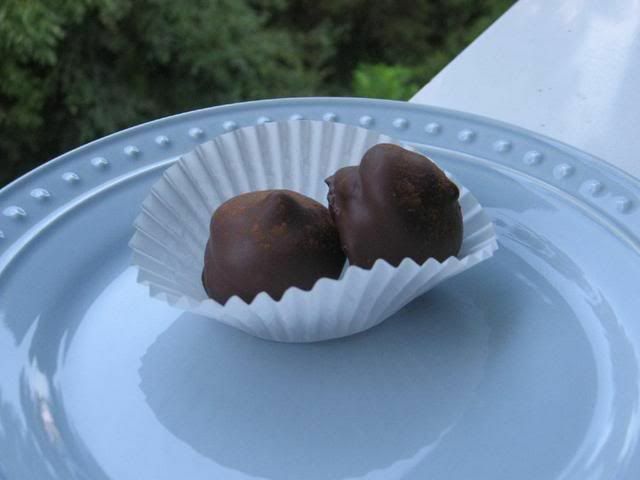 A friend of mine over at Barbara Bakes uses Ghiradelli dipping chocolate, which is another option. Enjoy playing with your Mallows! My family and friends loved these cookies, and I hope yours will too. 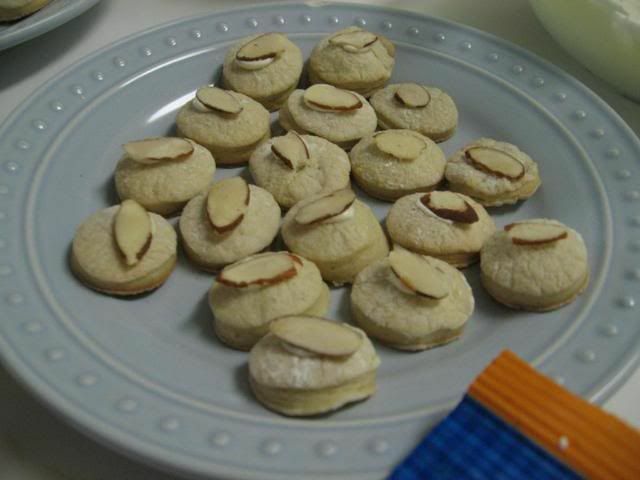 -Almond = 1/8 teaspoon vanilla extract, 1/8 teaspoon almond extract, 1/8 teaspoon imitation butter flavoring, and 4 drops of yellow food coloring (optional). 7. Roll out the dough to 1/8-inch thickness, on a lightly floured surface. 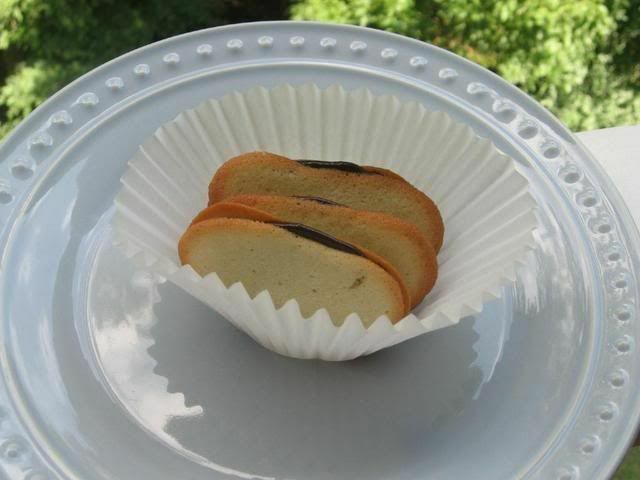 Use a 1 1/2 inches cookie cutter to cut out small rounds of dough (see my tips for rolling out dough, below). 8. Transfer to the prepared pan and bake for 8 minutes or until light golden brown. Let cool to room temperature. 1. 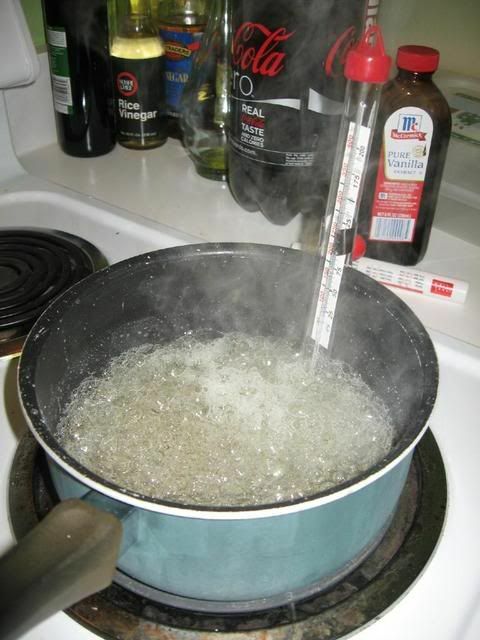 In a saucepan, combine the water, corn syrup, and sugar, bring to a boil until “soft-ball” stage, or 235 degrees on a candy thermometer (though soft ball stage can be eyeballed with a simple cold water test, I love having a candy thermometer around. Mine even has a line marked “soft-ball stage”). 5. Add the flavoring of your choice and continue whipping until stiff (it will take around 15 minutes, so I hope you took your vitamins this morning!). Note: You can also separate the marshmallow into multiple bowls and make multiple flavors, but if you do, reduce the amounts of the ingredients so they don’t overpower the smaller volume they’re flavoring. 1. 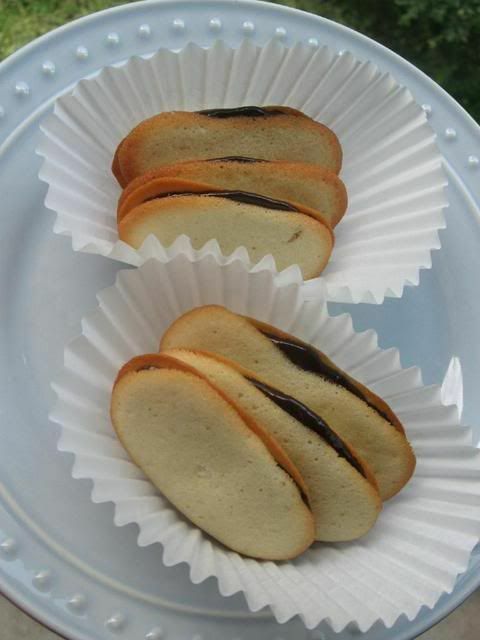 Pipe a “kiss” of marshmallow onto each cookie. Let set at room temperature for 2 hours. 2. Line a cookie sheet with parchment or silicon mat and cover with a cooling rack — this will be your drying rack! 3. Melt dipping chocolate according to package instructions. I like to set my bowl of chocolate in a larger bowl of hot water to keep it melted while I work. 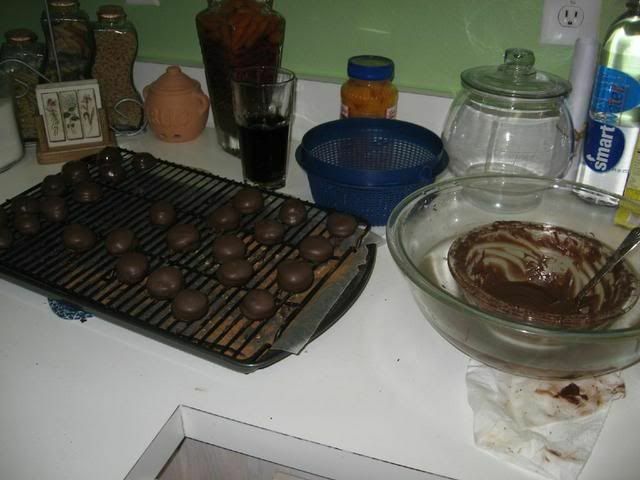 Just be careful not to let the water touch the chocolate, or it will seize and you won’t be able to work with it. 3. One at a time, gently drop the marshmallow-topped cookies into the hot dipping chocolate (see my video demonstration below!). 4. 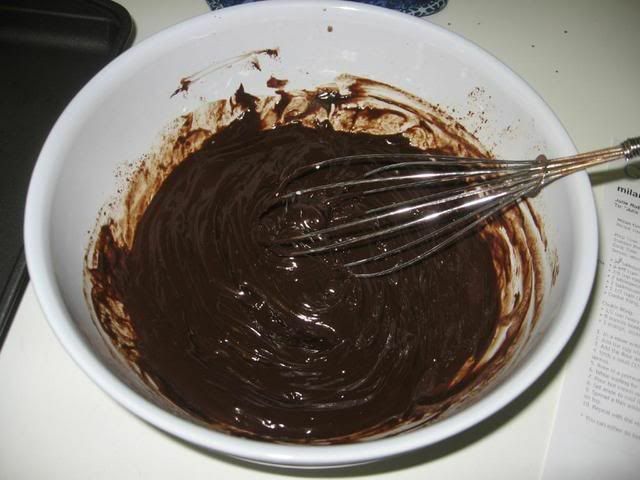 Lift out with a fork and let excess chocolate drip back into the bowl. Now’s the time to add toppings if you wish, while the coating is wet. 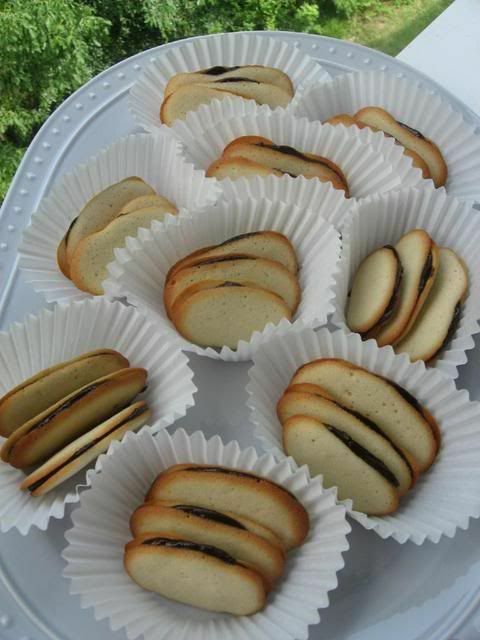 For a chocolate squiggle, let coating dry and use a ziplock of CandiQuik with the corner cut off to drizzle over cookies. 13. Place on the prepared pan and let set at room temperature until the coating is firm, about 10 minutes. 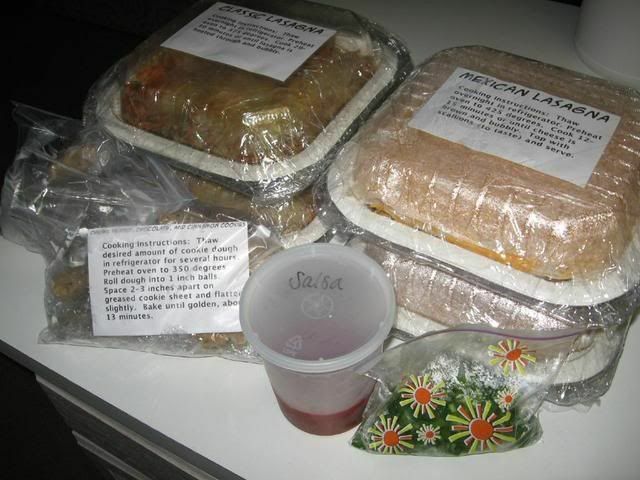 Store in an airtight container at room temperature (unless you’re in a very hot environment and notice melting, in which case, store in fridge). Work with small batches (about 1/3 of the dough) at a time, while keeping the rest chilling in the refrigerator. 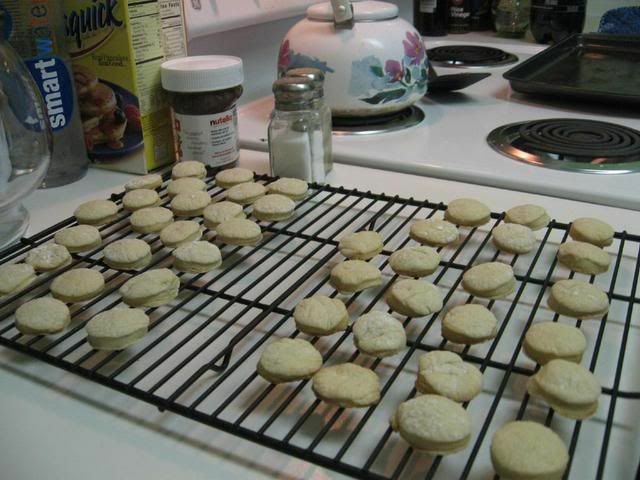 You can coat your workspace in equal parts confectioners’ sugar and flour if you’re worried about using too much flour (which can cause dough to get dry/tough). 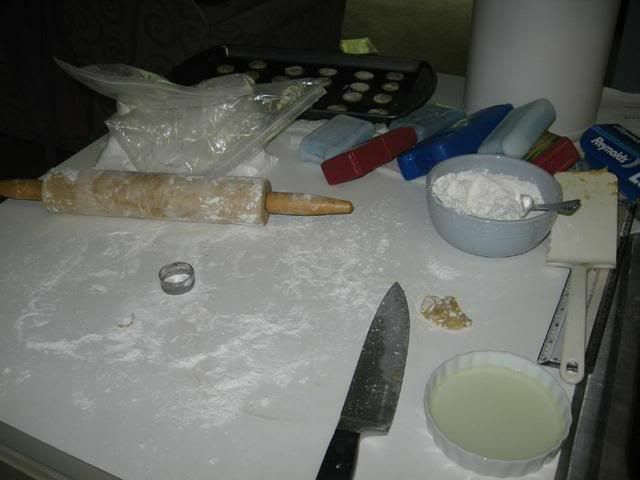 Roll dough immediately from the refrigerator, turning it often and redusting lightly with flour mixture to prevent sticking. If you don’t have a cool metal counter or marble slab (which I don’t), set some frozen vegetables out on your counter for a bit before you roll to cool it off. Then dry your workspace and roll. 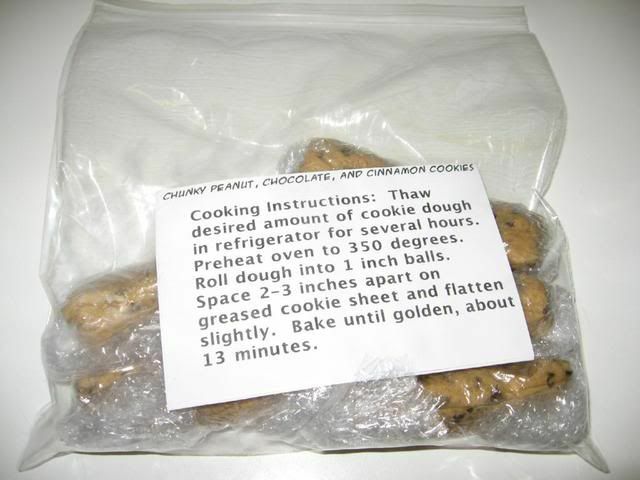 You can also refrigerate or freeze your rolling pin for a few minutes. Have a sheet pan in the freezer. 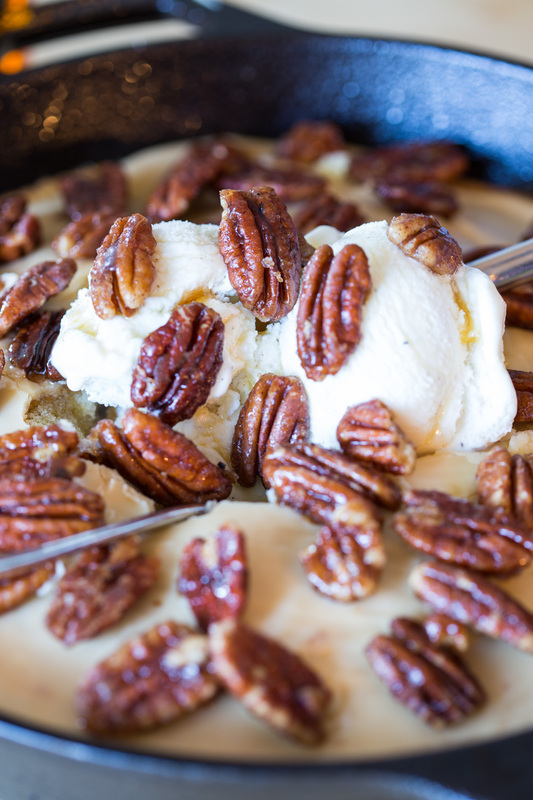 If you sense your dough is getting sticky/warm, put a sheet of wax paper on the dough and press the frozen sheet pan on top to cool it down quickly. 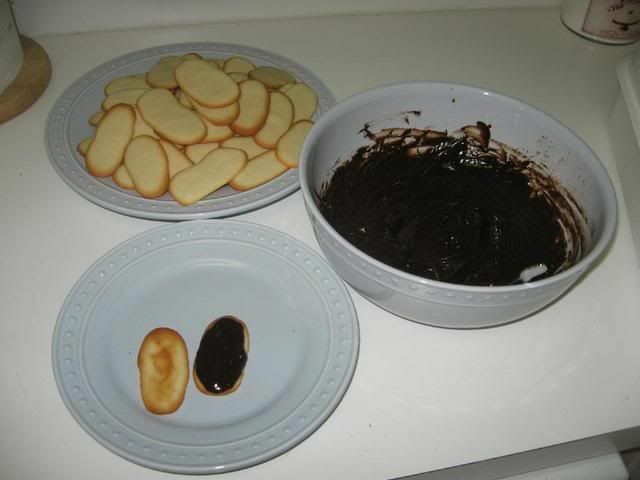 The One Minute Dipping Demonstration! Fresh from the oven and not so pretty. Piping Nutella filling onto my Hazelnut Mallows. The more you can fit, the better! For Almond Mallows, I used a bit of the almond marshmallow mixture to “glue” an almond sliver on the cookie before piping my marshmallow. Marshmallows of all flavors piped on. Dipping — see video above for a demonstration! Mmm! Have one of each!